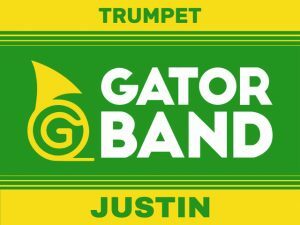 GatorBand Yard Signs, Decals and Magnets now available! We have had a few inquiries about having yard signs, car decals and locker magnets made, so our Boosters have put together this opportunity for you to order one! Please click here to fill out the form if you are interested in placing an order. Cost and details are on the linked form. The order deadline is Friday, February 2nd. Below is an example of the finished product. Personalization is optional. If you have any further questions after reading the linked form, please contact our fabulous GGBBC President, Amy Sedey, at president@griffingatorband.com.